In an update I pulled the grips off again and used a magnifying glass and these 73 year old eyes did discover a clock looking circle with a 96 in it, so my apologies- getting old is hell! PS- I don’t hear as good as I used to either. Also with the German proof marks on the slide and frame the gunsmiths and some serious Sig collectors at my gun club swear that this was a Gun manufactured in Germany and probably used as part of a law enforcement contact that were eventually replaced with newer weapons and sold to several US importers back in the day. They say that the German produced LEO 230’s had the logoed factory grips on them whereas the NH guns had the checkered plain ones. So my former Are Marshall guy probably was the original US owner he used as a backup behind his duty issued weapon which I believe was either a 228 or 229. I cannot factually substantiate any of this but I’m buying it for lack of a better story. What is the two letter date code on your slide. Is it KG? Also the P230 was never a NH pistol 100% made and imported from Germany. KH is 1997 and it is a P230? All 97 made models I’ve seen have been P232’s. Also the grip date usually matches the date code on the slide. My KH P232 has 97 made grips my KF P230 has 95 made grips. All I can say is that it is definitely a 230 (inscribed on both sides of the frame), has a S/N in the 182xxx range, has proof mark of KH on the slide and has factory plastic logoed grips with 96 on the inside of the right grip, and is blued and definitely not stainless steel. Maybe it is a rare priceless item like a rare postage stamp with some printing error!!! Well I'll be damned. I just did a Google search on P230 pistols and found two separate pictures of P230's with logoed grips. My thinking is that Sig decided sometime around 1995 or so to standardize on stipled, plastic grips and shortly after that decision decided to start to manufacture the P232. 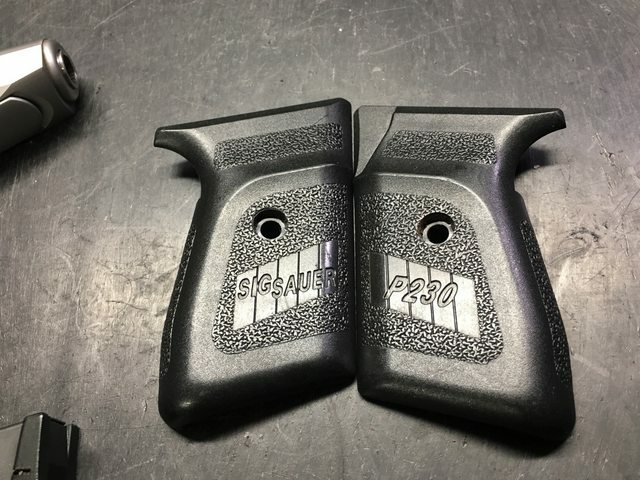 If you find a picture of these grips online (just use Google), you'll notice that they are the same contour as the checkered grips. The only difference is they have stipling (and logos) instead of checkering. They are certainly unique. But I'm not sure how much of a premium they would bring unless they were in pristine condition. Thank you for the education, mrsig27. It would not surprise me if Sig manufactured the P232 and P230 concurrently for several years, particularly if they had law enforcement contracts to fulfill. It took Sig Sauer several years after German reunification to drop the W. out of its import mark. They even misspelled "Tysons Corner" as "Lysons Corner" on at least one batch of P226's. If you want, we can start to talk about the bluing issues they had on P228 slides or the purple (plume) colored hammers. It would be great if we could get a pic on this site for members who are fans of the 230. If someone wants me to post their pic here, my email should be in my profile. Just for giggles I dug out the original grips from my P230SL. They’re ‘94 and are just the common checkered grips. It is supposedly police trade in, rumor was some Texas undercover narcotics squad, but who actually knows. I was rummaging through my Sig spares bin and low and behold, I have a set of the logo grips. Surprised me too as they're P230 profile but with what we're used to seeing as P232 style vs. the earlier plain checkered "West German" style plastic. What is the date clock on the backside of these? I have two KF 230's. Now I am going to have to find one with these grips.